The battle for Sen. Ted Cruz's senate seat was one of the biggest of the year. Fending off the toughest challenge in his political career, Sen. Ted Cruz is on track to serve Texas for six more years in the Senate, ABC News projects based on exit polls. 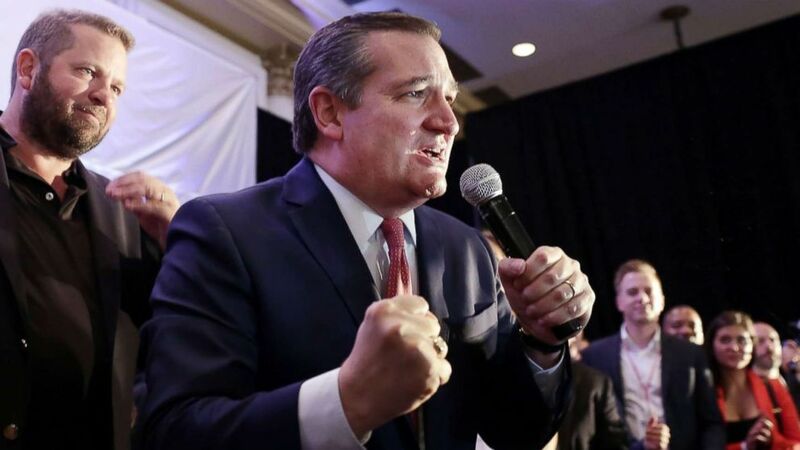 Cruz secured a win over his enthusiastic and well-funded opponent, Democratic Rep. Beto O'Rourke. "Tonight is a victory for the people of Texas," Cruz said to a cheering crowd at his victory speech. "Tonight is a victory for all the men and women in this room and all the men and women across this state that poured your hearts, your passion, your time, your energy to rising to defend Texas." "Securing the border and keeping our communities safe, and defending the Constitution and the Bill of Rights, and that’s a common-sense agenda that unites Texans from every part of the state," he added. After thanking his home state, Cruz also wrote in a tweet, "Now let's get back to work to defend jobs, freedom, and security for Texas and America!" O'Rourke said during his concession speech that he wasn't deterred by the defeat. The closely-watched Senate race was one of the highest-stakes contests for both political parties. Democrats hoped that a blue wave in the Lone Star State could change the electoral map for a generation, leading to unprecedented enthusiasm and a massive fundraising haul. Still, the Republican incumbent and former presidential candidate edged out his upstart opponent with a narrow victory, and secured his standing as a political force for conservatives. Boosting Cruz to his victory were male voters, who preferred the GOP incumbent by 15 percentage points over O’Rourke. But Texas' white, college-educated women, which make up 13 percent of voters in the state, were split down the middle -- each candidate garnered 49 percent of the vote. Looming over the race was the contentious confirmation battle over Justice Brett Kavanaugh, with 59 percent of voters saying that Cruz’s "yes" vote on Trump's Supreme Court pick was a factor in their decision, according to exit polls. 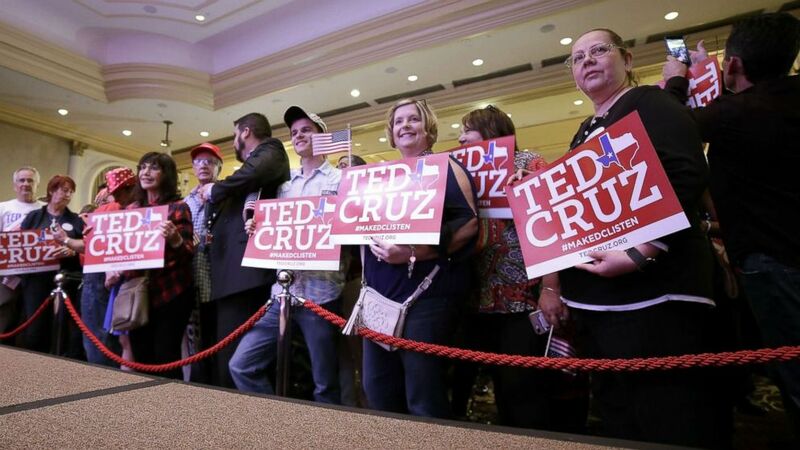 (Michael Wyke/EPA via Shutterstock) Ted Cruz supporters take position in front of the podium as they enter the election night headquarters in the 2018 midterm general election at the Hilton Post Oak in Houston, Texas, Nov. 6, 2018. 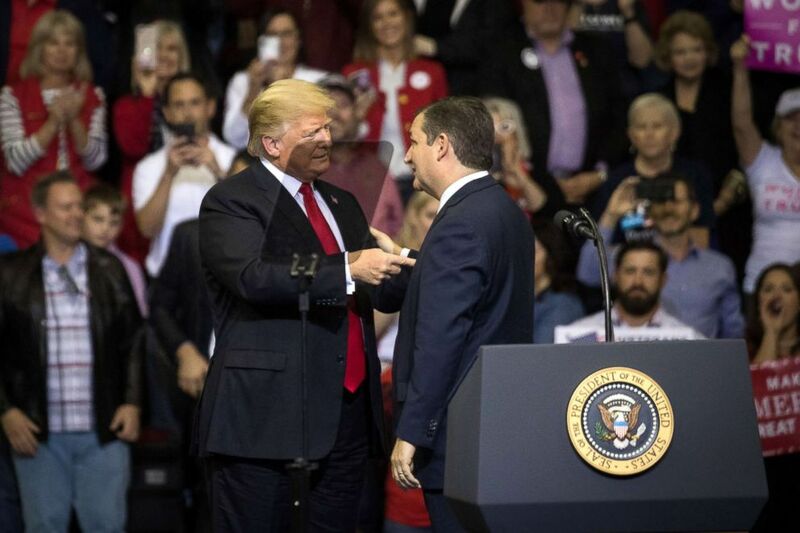 One of the most high-profile moments came when President Donald Trump, Cruz's former rival in 2016, flew to Texas to stump on Cruz's behalf last month. Trump did his best to bury the hatchet with Cruz in Houston, just two years after insulting the GOP incumbent's father and wife. 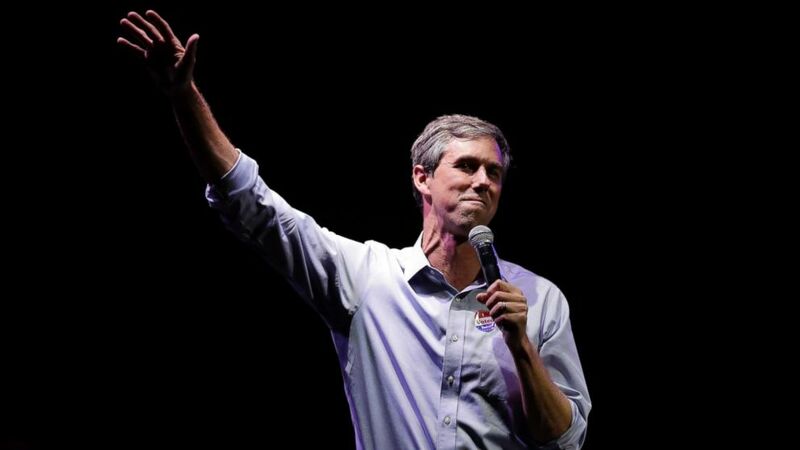 In an effort to compete against the unprecedented energy surrounding O'Rourke's bid, Cruz tried to paint O'Rourke as a member of the liberal, Nancy Pelosi-aligned faction of the Democratic Party. Cruz tested the limits of the progressive energy sweeping other parts of the country, and banked on a majority of Texas’ conservative-leaning electorate rejecting the progressive challenger. Mounting an aggressive, grassroots bid, O'Rourke crisscrossed the Lone Star State non-stop through Nov. 6 -- visiting all 254 counties in the state, according to his campaign. A crush of national media attention and his savvy use of social media vaulted him into celebrity-like status in the 2018 political landscape. Despite Texas' deep red roots, for Cruz, defending the seat in the Trump era was far more difficult amid shifting demographics. Trump won the state by only 9 percentage points in 2016, and leading into Election Night, O'Rourke, according to a recent Quinnipiac University poll, trailed Cruz by only 6 percentage points. 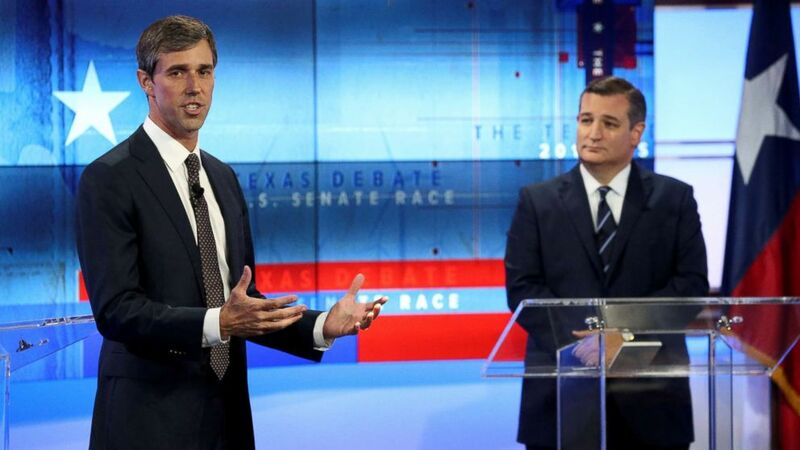 (Tom Reel/San Antonio Express-News/Reuters) Rep. Beto O'Rourke speaks, as Senator Ted Cruz looks on, during a debate at the KENS-5 Studios in San Antonio, Texas, Oct. 16, 2018. Cruz and O'Rourke were tied among Independents, according to the poll. "We have a real race in the state of Texas. The hard left is energized, they are angry, many of them are filled with hatred for President Trump," Cruz said at a debate in Dallas. After his failed 2016 presidential bid, Cruz was also contending with his own ambition -- his status as one of the most visible and polarizing figures in American politics remains firmly intact. Yet, O'Rourke's task of unseating Cruz in a state that has not elected a Democrat statewide since 1994 was steep. Cautiously embracing the progressive platform adopted by a growing group of Democratic candidates nationwide, the charismatic three-term congressman campaigned on issues like health care, abortion and gun violence. A pivotal divide between the candidates came as the immigration debate gripped the nation. O'Rourke even traveled to the tent cities, visiting children separated from their parents by the Trump administration's "zero tolerance" policy in June. (Loren Elliott/Getty Images) President Donald Trump is brought on stage by Sen. Ted Cruz during a rally, Oct. 22, 2018, at the Toyota Center in Houston, Texas. Cruz favored the Trump administration's immigration agenda, making repeated calls to build a wall and increase border security. In Texas, 4,884,528 people cast their ballots early in counties that report early vote, surpassing the total number of voters who cast ballots in 2014.